They are outstanding players from the junior ranks of basketball and tennis. Keifer Ravena, the son of fomer PBA star Ferdinand "Bong" Ravena of the Purefoods Hotdogs team was recently promoted to the Ateneo Blue Eagles Senior basketball team after graduation from high school this year. He was expected to be a vital cog in their quest for a 4-peat championship. As a Junior stand-out, he led the Eaglets to 3 consecutive championships in the UAAP. 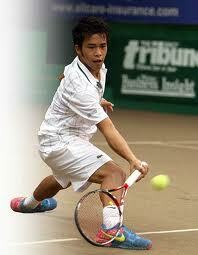 He was also a mainstay of several national junior teams that competed in several international tournaments. We watched the UAAP opening basketball games last Sunday, staying at the Big Dome for the 2nd game where Keifer would play. All told, his very first game as a senior was a flop, a disappointment. He was uncharacteristically scoreless on a single field goal attempt. I really don't know what happened. Coach Norman Black said he switched him to the No. 2 guard position which he was not comfortable. Whatever. Rookie jitters. For sure, he'll bounce back after this. The other rookie is Jeson Patrombon, the pride of Iligan City. After his discovery by his ever supportive coach, mentor, etc, Manny Tecson, he was brought to Manila and trained under the Jalosjos Alabang Tennis Club. This is the tennis club founded, financed and supported by former Zamboanga congressman Romy Jalosjos while he was in jailed Muntinlupa Bilibid prison. After dominating the local juniors tournaments, he campaigned abroad, earning him the top ten ranking at the end of last year. Significantly, he played in all the majors, Austaralian, US, French and the latest Wimbledon. Last week,for the first time, he formally joined the Philippine Mens team that played against New Zealand in their Asia-Oceana Davis Cup tie. Jeson played in the reverse singles in the last day of the tie ( by that time, the Philippines already lost the tie, 0-3). He won the first set but lost the next two sets and the match. To these young rookies, their first game was their baptism of fire. But they hold a lot of promise. Watch them from now on. They'll soon dominate the headlines.